For my concept development class, we had to come up with an idea for a billboard. Our main challenge was to show contrast, whether that be through value, color, shape, size, texture, scale, proximity, placement, or just something unexpected. I chose scale for my design. We were allowed to make part of the billboard extend outside our parameters of 3-1/2 inches by 12 inches, which can make it more eye-catching. I was originally thinking about doing some type of public service message, like “stay in school” or “learn to read.” To be honest with you, I really don’t like billboards at all, so I decided to keep it light. 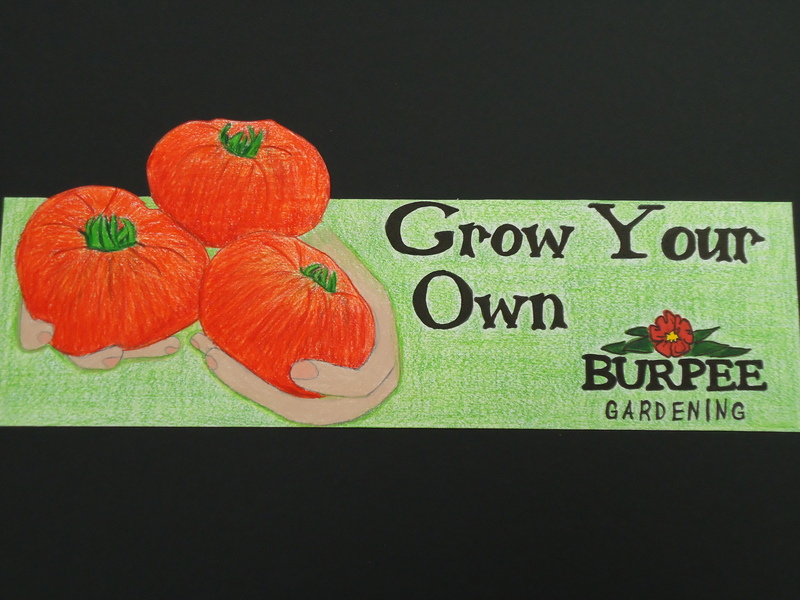 Since garden season is upon us, I thought it would be fun to do a billboard for a seed company. I worked out a few ideas with the usual process, thumbnail sketches and then a rough sketch, which I hated. So when it came time for me to do the final design, I worked a little slower and more deliberate. 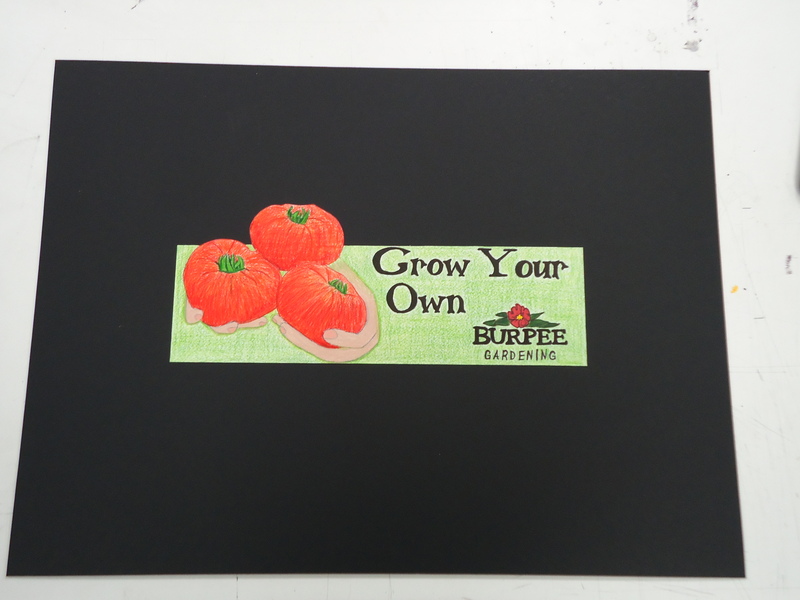 I really wanted those Prismacolor pencils to look shiny on the tomatoes and grassy on the background. I’m really happy with how this turned out, so it was a good lesson for me to keep pushing myself. I’m off to work on more projects for finals. Have a great weekend, everyone! This is fabulous, Terri! If I were driving down the road and saw this on a billboard, I would find a refreshing change. It’s very eye-catching. The tomatoes really pop!! I think that growing your own veggies is an excellent message! Mass agriculture is one of the problems of our civilization, in my opinion. I know it’s not a popular one, but when you read about it, you can understand why it’s so bad for the environment, and so much food & resources go to waste. I think you did a fab job on your project! Once again very good. That would make me stop to get fresh goods. You are so creative. Keep it comming. Good luck on those finals!! I love it – those tomatoes are so colourful – you did a wonderful job. I would glady have your “Billboard” in my garden. I love how the design pops up over the top. Very eye-catching! Wow, what a fantastic billboard Terri. It makes me want to go to the local greenhouse and buy seeds. I also love how the tomatoes extend beyond the border just a bit. I like quilts that extend beyond the borders too, they have more interest that way. This is a beautiful design Terri…would make a lovely billboard! Great idea to do a gardening theme! I love the colors you chose, and the black background really makes them pop…. Wonderful job, your talent never ceases to amaze me! I love it! You should send a copy to Burpee! Aww I love it! Fittingly enough I just got back from a weekend away and my hubby had planted all of our vegetable garden yumminess (including tomatoes! ), cute!